The next morning, after making some low tech coffee, I met Dave's wife and the three of us visited. Dave encouraged me to walk the labyrinth before I left for Ojo Caliente Springs. The trail passed ancient pueblo ruins. The sun was bright. Dave was clearing brush from the trail, so I figured if I screamed, he'd hear me. As I walked away from the revving of Dave's chainsaw, the male contingent of desert cicadas grew deafening. Their vibrations so filled the air that I wondered were they emanating from inside of me? My heartbeat quickened. How would I ever hear a rattlesnake over these damn cicadas? I jumped when I saw something move through the dry brush to my left. To my right was a short cliff drop off to the grassy field below. Fear and panic settled in. Do I just turn back? It wasn't that far back to the cabin. And really, what was I trying to prove by making it to the labyrinth? It's not that big of a deal. It was starting to get hot anyway. The rational part of me had a few good comebacks. So Jennifer Ann, what are the chances, truly, that you would meet your death on this short walk? I mean really let's be serious. How would you feel once you turned back? That's usually the question that gets me to pause. I have enough experiences of moving while in fear that I can remember it's usually worth it to get to the other side. With that internal dialogue, I started walking, slowly, but I was extra vigilant for any snake movement. Sometimes in the midst of our fear, we do get a glimpse of what could be, if we hold steady and just keep putting one foot in front of the other. As I stood at the entrance, I paused to acknowledge my intention for this walk in the labyrinth. I wanted to be open about what fear had to teach me. Just breathe, walk, and pay attention. The cicadas were still blaring, but my center of gravity was back down in my belly and not my brain. Way better. The sun burned my neck and sweat tendrils rolled down my cheeks and underarms. A circular hole the size of my fist appeared in the dirt. A snake den? A groundhog home? Who would greet me if I stepped too close? Grounded in the pattern of breath and step, I stopped ascribing motive to the desert sounds. The vibrations began to embrace me...supported by the sounds. 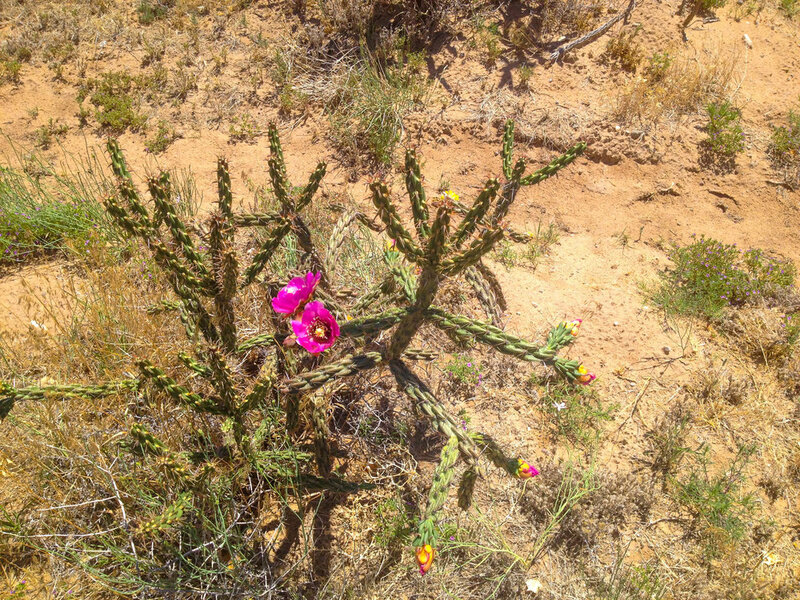 At the center of the labyrinth, the spiky cactus shot magenta through the dusty brown desert. So bright...alive. Almost glaring in contrast to the dead scrubby grasses. Singularly absorbed by the cactus blooms, I forgot about my fear. My quiet mind companioned me on the return trip from the labyrinth's center to its exit. I reached the path's end. The fear and tension had evaporated, just like the sweat on my neck when the breeze brushed it dry under the shade of a cottonwood. It wasn't that peace came because I pushed through fear. I didn't push through it at all. Rather, I surrendered. Staying paralyzed by fear, or retreating when it shows up, is the opposite of surrendering to it. By letting it live in me, it became something dynamic and alive. It was only when I stopped fighting it, that my fear could shift into something else. Even when I couldn't breathe. Even when the panic was at my throat. Even when the cicadas sounded like thousands of rattlesnakes. Fear taught me, again, that the only way out is through.